A statement from Stu Stone, director of "SCARECROWS"
There's been a bit of controversy surrounding the new horror film SCARECROWS - foolish teens are copying events in the film, and sneaking onto farms for the same experience - so director Stu Stone has issued a statement. "SCARECROWS," the stoner-horror film from Uncork'd Entertainment, is snaring fans quickly – but they're going about their fandom for the Stu Stone-directed movie in the wrong way. The audience has connected with the movie to such a degree that it has become a problem for some farmers. 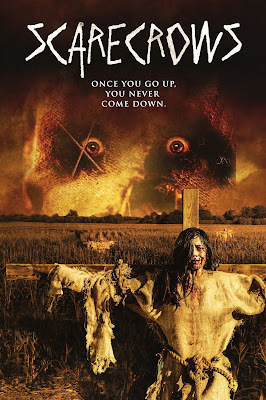 "SCARECROWS" revolves around a group of stoner-teens who unknowingly trespass onto a farmers field. Unbeknownst and unluckily for the teens, this farmer tortures people who uninvitedly trespass on his property. The killer hunts them down, nails them to crosses and hangs them in the field as human scarecrows, leaving them to die. A couple weeks back Producer Adam and Director Stu noticed their inboxes had an unusually high number of emails. Confused, the guys investigated to find several emails from farmers reporting teens sneaking onto their property and getting high in the cornfields and trying to find their way out. They connected with some of the farmers who stated that the kids had seen the movie on the streaming platform and were imitating it in real life. The farmers thought the filmmakers were irresponsible in not making it clear that people should not copy a movie. Completely dismayed, Adam and Stu talked the farmer down and agreed to release a statement encouraging people to not imitate a horror movie and get stoned in cornfields. Please, while we are incredibly flattered that you liked our film, we implore everyone to not copy what you see on tv or in the movies. Trespassing is illegal and could be outright dangerous. You and your friends could get SHOT AND KILLED, and its just not worth it. We do however encourage everyone to get high and watch the movie from the safety of your own homes! More on the official page of the film.